Gorgeous Custom Log Home - Perfect for Families/Couples! Check Out the Video! Welcome to the Blue River Lodge! This luxurious custom crafted, log home comes is a rare find complete with an outdoor 7-person hot tub, sauna, steam room, spacious two-car heated garage, multi-room sound system, pool table, Indian tipi, outdoor fire pit with log benches (and marshmallow roasting sticks), huge deck (and separate private deck for the Master Bedroom), wireless broadband, acreage, views, and more. If you are looking for a true Colorado log cabin in the woods yet want to pamper yourself with the comforts of a luxury spa (and very close to skiing and the town of Breckenridge), this is it! The spacious living areas include a large great room with woodstove, huge master bedroom (King size bed), two guest bedrooms (each with Queen bed), an oversized bunk room that sleeps up to 8 (two full size bunks and four single size bunks, all built-in) and three very spacious full baths to comfortably accommodate three or four couples or families with children. With top of the line furnishings, a fully-equipped gourmet kitchen, down comforters and pillows, and plenty of living space, you will feel like a guest in a private home rather than a tourist in a rental property. Whether you want to relax under the stars in the hot tub after a day of skiing, curl up next to the woodstove with a good book, snowshoe out the back door (6 sets of snowshoes are provided), take a sauna or steam, or shoot a game of pool, this house has everything you need for a perfect Colorado mountain vacation. Other amenities include Satellite TV, wireless broadband, wood stove, gas fireplace, very large 'mudroom' for boots and jackets, and even an authentic Indian Tipi complete with firepit (and marshmallow roasting forks). Picture windows and two large decks offer magnificent views in every direction! Front deck looks into mountain peaks and rear deck faces National Forest. Secluded from view from other houses, the Blue River Lodge is nestled in Aspen and Pine, five minutes from Breckenridge with quick access to the ski areas of Breckenridge, Keystone, Copper, A-Basin and Vail. The Blue River Lodge is also close to world class golfing, shopping, back-country trails for hiking and biking, rafting, and gold medal flyfishing. Please review comments in our guestbook and you will see that our guests often comment that this home is one of the finest properties available in Breckenridge. Please contact us for a rate quote as rates can vary depending on the season and size of your group. Please also feel free to contact us with any questions, if you would like additional photos, prior guest references or more information. Most of our guests are repeat customers so we recommend booking well in advance. We live in Denver and manage this property ourselves. It is a rare find -- a true log cabin in a very private setting with all the furnishings and amenities you could ever want. Please contact us for more photos and any questions you might have! This house has great views and privacy yet is very close to the town of Breckenridge for shopping, skiing and restaurants. This is a true custom crafted log home, not a 'kit' log cabin, located on a very private lot next to National Forest. We believe it is a one of a kind and our guests agree. This is not your typical rental house and is furnished as if it were your own. It has a two-car heated garage, gourmet kitchen, large private hot tub, sauna, steam shower and pool table. For the children we have a huge bunkroom, an authentic Indian tipi complete with firepit and log benches. We provide the 'extras' that are not typically included with other rentals -- tons of board games, Jenga, puzzles, cards, down comforters and pillows, gourmet kitchen provisioned with spices and top of the line cookware. We make every effort to distinguish our house as the best on the market in Breckenridge. toilet, tub, shower, Huge master bathroom w/ double sinks and clawfoot tub. toilet, combination tub/shower, Spacious bathroom on main level between guest bedrooms. toilet, shower, Very spacious with sauna and large steam shower. All bathrooms are very large. Master Bathroom includes copper bathtub with views into the forest. The world class resort of Breckenridge is only minutes away! Our house looks directly into the mountains and National Forest. It is very private and you cannot see any other houses from our property. Gas forced air furnace heats the whole house. The lower level and garage are separately heated with boiler hot water heat system. All 100% cotton high thread count linens, luxurious down comforters and down pillows. All bath towels provided. Brand new front load commercial size washer. Front load commercial size dryer. Outside parking for up to four vehicles. Heated two-car garage with ski storage racks. Deluxe wood stove in Great Room. All wood provided. Beautiful living room with picture windows into mountains. Leather furniture, woodstove... Relax and enjoy! Top of the line stainless "french door" refrigerator w/ ice maker and water supply in door. We provide both a Keurig coffee maker and traditional drip coffee maker. All spices, sugar, tea, dishwasher detergent, soap and paper items are supplied. Gourmet kitchen with custom cabinets, Corian counter surfaces, all stainless appliances, and counter seating for three. All spices and other basic kitchen supplies (paper towels, dish soap, etc.) are included. Beautiful dining room table seats 10. Excellent views. Flat screen TV's in Family Room, Master Bedroom, Kid's Bunkroom and one Guest bedroom. Satellite TV with expanded package. iPhone, iPad, etc. compatible stereo system with multi-room speaker system (Family Room, Greatroom and Outdoor Hot Tub can be separately controlled). Huge library of paperbacks and Colorado guide books available for you to enjoy. Almost every board game you could imagine is stored in the hall closet for your enjoyment. Top of the line pool table. Firepit with benches in the back allow you and your family many nights of pleasure roasting marshmallows and gazing at the stars. A second deck extends off the master bedroom which faces National Forest and is very private. Very large front deck (about 450 square feet). Picnic table on deck and deck furniture with cushions. World class ski resorts of Breckenridge, Keystone, Copper, Vail and Beaver Creek all within minutes away. Very large top of the line 7-person hot tub with 64 jets that is professionally maintained and cleaned each week located on deck (see pictures). This hot tub is exclusive to this property and is not shared. Authentic Inidan tipi with firepit, snowsoes provided, Steam room/shower. 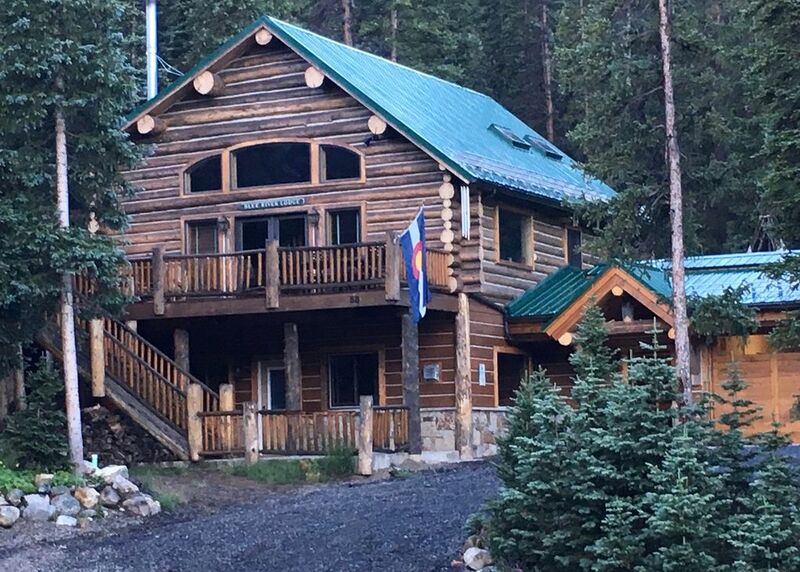 The Blue River Lodge is close to the town of Breckenridge yet located in a private setting where you are secluded and protected from the noise and bustle of town. Surrounded by Aspen and Evergreen trees with mountain views you will feel far away but with a short ten minute drive you will find yourself in the world class resort of Breckenridge which offers some of Colorado's best skiing, fabulous restaurants, excellent shopping, spas, nightlife and more. Winter activities include x-country skiing and snowshoeing from the Breckenridge Nordic Center (or out our back door, snowshoes provide! ), terrain parks, snowmobiling, dog sled rides, and of course world-class skiing for all ability levels. Copper Mountain, Keystone, A-Basin are all within 30 minutes and Vail is only a 50-minute drive. If you are looking for a great summer escape, Breckenridge and Summit County offer some of the best hiking trails, mountain biking, fishing and rafting in Colorado, The Breckenridge Golf Course, designed by Jack Nicklaus, is only 15 minutes away. If boating, sailing or stand up paddle boards are your thing, Lake Dillon is only 20 minutes away. The Blue River Lodge offers a true Colorado log cabin experience complete with almost every amenity and luxury you could want -- maintained 7-person hot tub, sauna, steam shower, fire pit in back, Indian tipi, 2-car heated garage, pool table, large deck, every board game you could imagine and more -- most guests tell us that they hardly went into town because they enjoyed the Blue River Lodge so much! Guests often comment that staying at the Blue River Lodge is like having your own private spa - steam shower, sauna, outdoor hot tub, oversized showers with natural stone, copper bathtub - all nicer than most luxury spas. The tipi behind the house (with firepit inside) is fabulous for the kids, and an oversized firepit outside complete with benches and marshmallow roasting sticks will provide hours of enjoyment. This log home borders National Forest yet is close to world class resorts -- the opportunities are endless!